Being powered by BootStrap 3, Hathor has got flexibility, which makes it much easier to edit depending upon particular requirements. Using BootStrap assures a speedy as well as consistent development along with easy customization. Hathor comes packed with revolution slider as one among its design features. 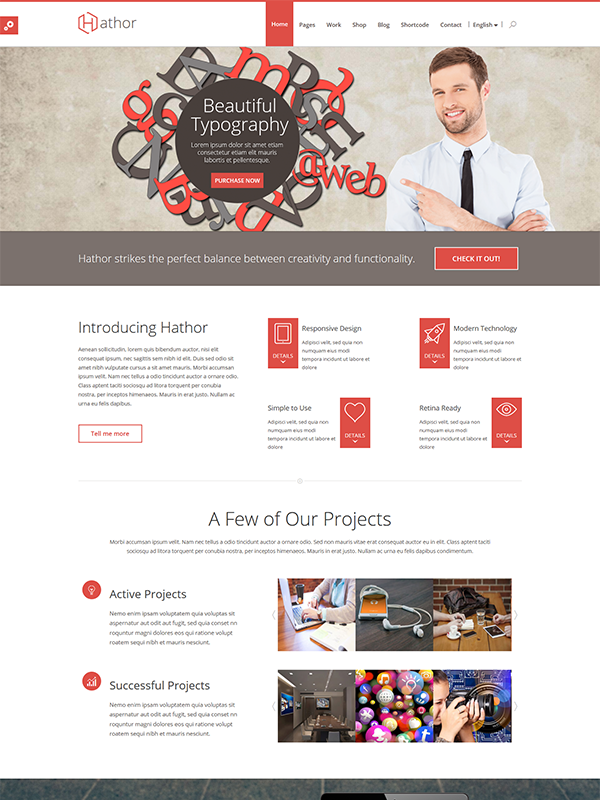 Being a multipurpose HTML template, it is extremely useful for diverse business portfolio. It has also got an easy-to-use interface that is also helpful in creating new slides. This exceptional multipurpose HTML template has an outstandingly designed 404 error page. It comes to use when you wish your clients to stay on your websites during server or link host error, which may come across during slower connection. This HTML template has got a responsive layout meaning it can shrink down to any device size without compromising on the quality of the layout as well as the design. The responsive feature makes it stand out on a variety of devices. 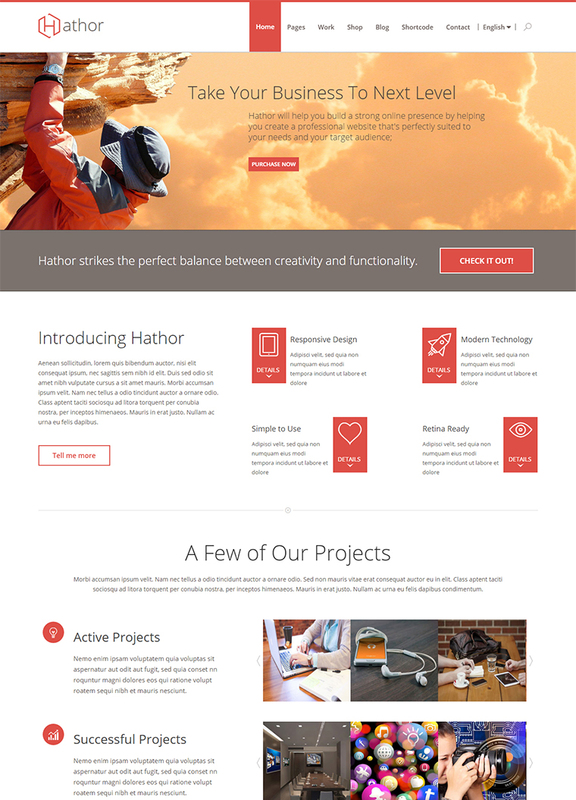 Being a retina ready HTML template, Hathor promises an exceptional user experience throughout their browsing session. It also ensures the quality of the template that is very much essential to manage in this ever-competitive web development era. One exceptional feature of this multipurpose HTML template is that it also support Google web fonts that offers it validation of the giant search engine. 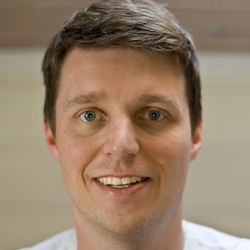 It additionally help your users get an awesome user-experience. The developers at theem’on have built this template with all their expertise. With immense experience in HTML template development, we have come up with a flawless template with some exciting features. It is a fast loading template tested on GT Metrix. Built using BootStrap 3.0 for true responsive rendering. Multiple color schemes and font variation to choose from. The semantic coding and W3C markups of this template make it SEO-friendly which is good from the perspective of SERP. This template is built using the optimized images to ensure its search engine friendliness. This template offers 4 unique homepage designs that allow the users to design the template as per their choice and nature of their business. It helps the users to design templates in vivid designs to break the monotony. This template is enriched with the perfect data-binding and validation of input controls as it features the forms with Angular JS. The feature-rich template is multipurpose and this quality reinforces this fact. The template has been design with easy functions. Even if you face any issue while using this template, our active support professionals are always at your service with the most appropriate solution to your query. The swift loading speed makes this template more special and functional. The implementation of technology like BootStrap 3.0 and W3C validated markups &codes ensure the faster loading speed of the template. This template is blessed with the characteristics of multi-browser compatibility and supports all the major desktop and mobile browsers, thereby ensuring the perfect appearance on different major browsers. I recently bought the CHARITY-Non Profit HTML template to use for new website. The template was great, FULL of various page styles, and loaded with great features. A few times I got stuck trying to make changes and I reached out for support to help me get over the hurdle. Wow! I was very pleased with the support I recieved from ALOK. I received answers within hours of my request.! Very pleased! Thank you! Keep up the good work and thank you for your help! Great template with lots of features! Awesome tech support and fast response. Very satisfied! I purchased a product designer tool and I can surely tell that it is the most powerful and beautiful product designer tool I have ever used!!! Strongly recommend and hope the team and keep develop this great product! !